Changing tires manually is laborious and time-consuming. Especially if car trouble is the cause, nerves quickly get frayed, even more so if the bolts are rusted on or stuck fast. A car impact driver makes much lighter work of this task. 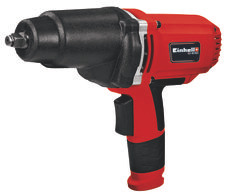 A 12 V impact driver can be connected to the cigarette lighter and is therefore ready to be used on the road as well. In an emergency it can even be connected to the car battery too. Along with the obligatory car jack, this makes the impact driver a companion you would not wish to be without as a car driver.